LANCASTER – Two drivers were killed Monday morning in a two-vehicle crash near Lancaster, authorities said. The crash took place about 6 a.m. Monday, Oct. 29, on state Route 138 (Avenue D) west of 150th Street West, according to a California Highway report. An “unknown driver” was in a 2002 Nissan Altima headed eastbound in the westbound lane of SR-138 at approximately 75 miles per hour, the CHP report states. The Nissan collided head-on with a 2003 Ford that was traveling westbound on SR-138 in the westbound lane, the CHP report states. The Ford’s driver was pronounced dead at the scene. 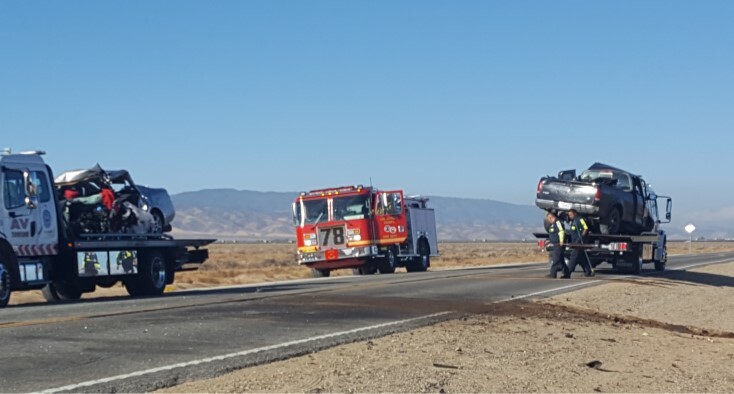 His name has not yet been released pending next of kin notification, but he was a 61-year-old man from Lancaster, according to the CHP report. Authorities are still working to identify the driver of the Nissan, who also was pronounced dead at the scene. No information on that driver was immediately available Monday afternoon. Alcohol or drugs were not suspected factors in the collision, according to the CHP report. The cause of the crash remains under investigation by the CHP. UPDATE: The deceased have been identified as Bryan David Armstrong Jr., 32, of Fremont and Cosme Mendoza Jimenez, 61, of Lancaster. Armstrong was the wrong-way driver headed eastbound in the westbound lane of SR-138. 10 comments for "Two drivers killed in two-vehicle crash near Lancaster [updated]"
Word is the driver of the Ford was going to pick up a friend to go hunting & his friend sent him a text just about the time of the collision. I still don’t see how he didn’t see the other guy coming. that particular stretch is pretty straight with good visibility. I’m wondering about the Kamikaze thing as well. Did anyone check the headlight switch on the sedan? I don’t drive that stretch anymore. I’ve also had several pull over to the shoulder incidents as well. I drove by this accident about 10 minutes after it happened. If I had left home earlier it could have been me instead of the guy in the Ford. Pure speculation, but eastbound out there at six AM the guy might not have been able to see anything but the sun. I almost died on that highway a few months ago. I was traveling westbound when A STUPID driver who was traveling eastbound decided to pass a truck. I had to immediately enter on to the dirt shoulder to my right in order to avoid a head-on collision. I was traveling at 55 mph and the stupid driver was travelling at approximately 65 mph. The stupid driver made no attempt to correct his stupidity. He just kept coming at me like he did not care if he lived or died. I took this road because it is a shortcut to northern California. But sometimes a shortcut is a life-cut short. So no more shortcuts. I would rather take the long path, the 14 to the 5 while listening to my favorite music and sipping a hot cup of coffee and enjoying a long life if Cosme Mendoza Jimenez had followed this advise he would have been alive today. RIP my brother driver. Assemblyman Tom Lackey the so called Highway Patrolman has done nothing in office to make AV Highways safer. Has added no By-pass lanes or L.E.D. Wrong Way or Stop Signs on Hwy 138, 18, 58 and the 14 Freeway. He lost us hundreds of millions $$$$ in direct item funding to Antelope Valley. Nothing in two Park Bond Measures or Transportation even though he knew the were going to pass. We will have to pay on these State bonds for the next 40 years! No benifit. He dies not bring home the Bacon to his district. Unemployment ratell twice national average Cal City had to turn to POT and has 5 times national unemployment average east kernel 3 times. Voting Lackey out. Do not support and vote for incompetent leadership. Worst AV State Representative Ever! Still better to vote for him than a Democrat. Jason I got to say you are a nut who is off his meds. You pimp your real estate for a commission a-lot, greedy. They need to widen the 138 segment from the 14 to the 5. It’s getting increasing traffic and people are just too stupid to drive in that highway. It’s terrifying how people try to pass in the tightest of situations.